The blaring dance music that escapes from within suggests SlideOn79 is going to be a rowdy affair but upon entering, we’re just left confused. Pop art covers the walls, a stark contrast to the art deco furniture and a big screen showing sports. 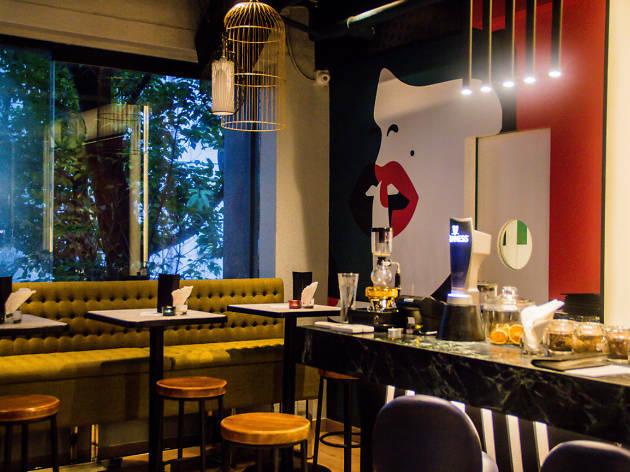 Though SlideOn79 is described as ‘playful, dynamic and ever-evolving’, we’re left wondering what this bar is trying to be. Sidling up to the bar, we’re greeted by tattooed bartenders dressed in sharp waistcoats. 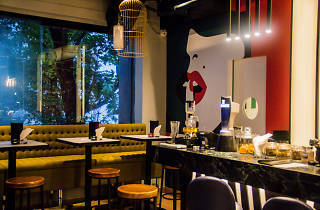 The menu – featuring homemade syrups and bitters – suggests that carefully crafted cocktails are the order of the day, so we opt for a Buddha’s Creation ($118) and Naughty Berry ($118). The former is a blend of an unnamed single malt whisky, apple liqueur, basil, lemon juice, and a cinnamon syrup. It comes served in a metal tankard – the kind certain cha chaan tengs serve milk tea in – topped with a semisphere of ice. The ice, perched on top, looks pretty but is useless as it does nothing to cool the drink. The cocktail itself is overwhelmed by the sweet synthetic flavour of its apple liqueur. There’s barely a whiff of whisky or cinnamon and the lemon is nowhere to be found. The Naughty Berry is a little better, with Bombay gin, black raspberry, egg white and homemade cardamom, vanilla and clove syrup. The fruity flavour is pleasant enough but there’s too much egg white and too much going on in the syrup. Keeping things simpler would have worked better. Hungry, we order the cheese toast with onion, coriander and chilli ($78). It’s decent but the cheese completely dominates. The onion tempura ($88) is crisp and not too oily but $88 for what are essentially fancy onion rings is a little much.